Cleaning And Maintaining The Functionality Of Grease Traps Waste water that comes out if any establishment, be it a house, a restaurant, a hotel, school, canteen etc., consists of a number of different particulate matter. Some of these are miscible, some immiscible. This immiscible matter generally consists of grease, fats, oils etc., which if allowed to get into the water disposal system might give rise to clogging or blocked drains or even a sluggish flow. Hence in order to ensure that these particles are not able to enter the system, special traps have been designed to catch them for their disposal separately. Such traps are called grease traps. Thus grease traps form a part of the plumbing system too but they are generally installed usually outside the house or the establishment. This trap helps to capture grease and other oily particles thus preventing their entry into the waste disposal system. If allowed to do so, they are broken down very slowly by anaerobic micro-organisms present in the septic tanks. Thus it remains behind forming a scum layer for a very long time thereby eventually clogging up the whole septic tank system. The position in which the grease trap is installed ensures the passage of grease free water into the septic disposal system but traps anything which even remotely resembles grease or oils. But it should not be made to function as a food disposal unit. Large and small food particles need to be cleaned away and put into the garbage disposal unit. Scientifically, food, if allowed to remain in the grease trap tends to rot and break down thereby releasing toxic and potentially harmful gasses like hydrogen sulphide. This gas further combines with water to form a mild sulphuric acid which is well known for its corrosive action on concrete, steel etc., thereby damaging the trap itself. 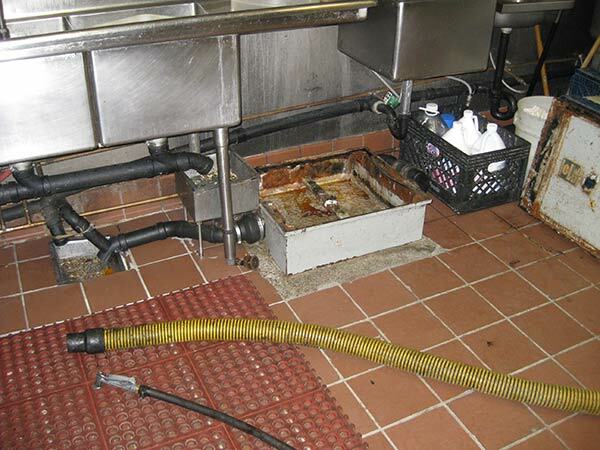 Passive grease traps are those that are installed under sinks or adjacent to the dishwasher outlets. They are point of use units and small in size and can hence be cleaned easily by just taking them out and dumping the grease into garbage disposal units and reinstalling them. Gravity interceptors are large in-ground tanks, constructed of fibreglass, steel or concrete have much larger grease holding capacities and are installed in the backyards of buildings like hospitals, restaurants etc. They need to be cleaned out regularly with the help of grease trap pump outs on a regular basis. Grease recovery devices or GRDs facilitate auto-removal of grease. Grease blockages result in the clogging of the traps. Keeping a check on operational and safety hazards. Care should be taken in the selection of a good company to do the grease trap pump outs so that the job is done properly. It is also mandatory that the person staying in the house check the state of the grease trap once before the workers shut it up. This is done to check if the workers have actually taken out the whole of the grease that has accumulated in the grease trap. More often than not it has been found that accumulated grease left behind even after cleaning tends to make the grease back up lead to an overflow. Another point to be noted is to check if the grease trap lid is properly closed since this too can lead to many a nasty incident or consequence.